A right-wing Republican congressman is under fire from his own party after questioning why terms like "white supremacy" are controversial. 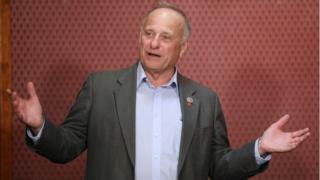 Steve King of Iowa also pondered in a New York Times interview when labels like "white nationalists" became offensive. Fellow Republican Jeb Bush said condemnation was not enough, and called for party grandees to oust Mr King. Mr King has since defended his remarks, saying they were mischaracterised. Speaking on the floor of the House of Representatives on Friday, he said he regretted "the heartburn that has poured forth" as a result of his interview. "I want to make one thing abundantly clear: I reject those labels and the evil ideology that they define." "As I told the New York Times, it's not about race, it's never been about race," he continued. "Under any fair political definition, I am simply a nationalist." But other Republicans were unconvinced by Mr King's explanation. "Republican leaders must actively support a worthy primary opponent to defeat King, because he won't have the decency to resign," Mr Bush, a former Florida governor and one-time presidential hopeful, tweeted. In an opinion piece for the Washington Post, Republican Senator Tim Scott, who is African American, criticised both Mr King and the party's response. "Some in our party wonder why Republicans are constantly accused of racism - it is because of our silence when things like this are said," he wrote. Steve Scalise, the Republican whip in the House of Representatives, told reporters it was "offensive to try to legitimise those terms". House Republican Conference Chair Liz Cheney called the language "abhorrent and racist". The Republican backlash follows a tepid reaction from National Republican Congressional Committee chairman Tom Emmer. The Minnesota representative told the Hill it is too soon to decide whether Mr King would have the committee's support in his re-election bid. He later added that he disagreed with Mr King's statements "as they've been characterised". The congressman, who has served for 16 years, reclaimed his seat in November narrowly, with just three percentage points separating him from his Democratic challenger. This is far from the first time Mr King has sparked racial controversy. Last year, he saw his victory margin diminish after making headlines for reportedly supporting a Toronto mayoral candidate with neo-Nazi ties. In 2017, he claimed diversity was not America's strength. He also said: "We can't restore our civilization with somebody else's babies."